Back in 2013 George broke his finger. 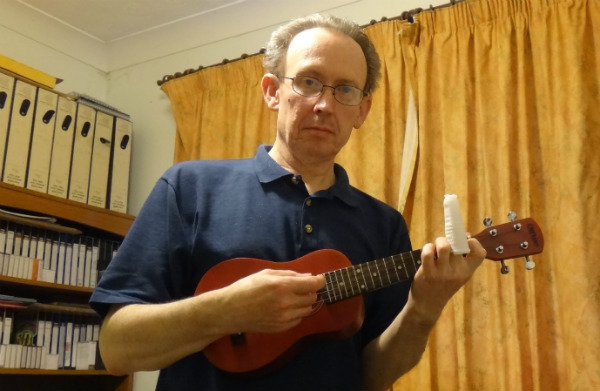 I wondered if it would be possible to play the ukulele with a broken finger. It seemed likely his finger would be bandaged, and in a splint. So I sent George a selfie, showing what I thought would be the best way to attempt playing in these circumstances. I didn’t receive a reply. Within a couple of weeks I had re-imagined this accident in the aftermath of World War Two. But it was just a starting point. Everything in the novel is fictional. Set in the declining world of variety theatres, where post-war optimism has just about evaporated, this novel tells the story of the banjo wars, and their aftermath. Just after the war a handful of merchant seamen begin touring the country in Benny Brand’s Banjo Band. Following an argument, Billy Ray leaves, to form his own band. The original disagreement turns into a bitter fight over who owns the act. By the end of October 1948 one man is dead, and another is in prison accused of his murder. The police think it’s an open and shut case. Robert Rafferty, best friend of the accused, is certain things are not what they seem. Robert delves into a world of unscrupulous agents, crooked art dealers, international smugglers, sexual predators, and dodgy music hall acts. In the race to discover what really happened, before the case comes to court, nothing goes according to plan.